Whew. It took me two full weeks to power through this 800+ page epic. I've been following this series, and impatiently waiting for each installment, since a friend recommended Cinder years ago. 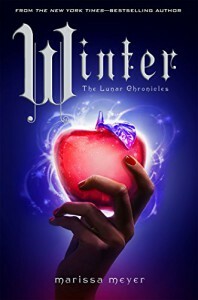 Cinder, a retelling of- you guessed it!- Cinderella caught my attention and each following book introduced a newly imagined fairy tale heroine to the mix. This series just tickled me. Meyer deftly created a new world that feels recognizable but fantastical, the perfect backdrop for fairy tales come to life. Each girl, Cinder, Scarlet, Cress, and Winter, use the strengths of their respective tales (Cinderella, Little Red Riding Hood, Rapunzel, and Snow White) to wage a war against norms... literally. As expected (this is a fairy tale, after all) everything leads toward a happily ever after, which is improbable given the intensity of the revolutionary war the series tackles. My one complaint is probably that, for such a massive book, the pacing felt off. An entire revolution organized and executed in 48 hours? Hmm. But it's a very fun tromp through a wonderfully rich world.